I went eyepiece shopping today! I first visited Efstonscience. This is where I bought my SCT telescope, so there's a certain amount of loyalty (guilt?) I feel. That said, as I was walking in the back door to the place, I had a flashback to some previous visit where I did not get the warm fuzzies. I put that out of my mind: let's collect data! Bruce was busy on the phone as I wandered into the showroom. The other rep was helping a woman with a Swarovski purchase. I surveyed the central display cabinet. First impression: there are a lot of empty slots... Still, I spotted a few candidates. Later, Bruce supplied some stats. All are 2" shaft eyepieces except the first Tele Vue. As I walked into Khan Scope Centre, I saw Eric hunkered over the computer register. I said hello. Eric replied, "It's so nice to see a familiar face here." We chitchatted about space shuttles, lunar eclipses, old cars, and what not. Onto the main event, Eric showed me a number of longish focal length eyepieces. For each, he calculated the true field of view. Nice touch. That let me get a very good impression of what I would see. But, as I surveyed what he had brought out, I wasn't bowled over. "Any other options?" I asked. "Oh, and let's pass on the 30mm Meade ultra-wide." Eric spotted some boxes on the lower shelf. "There are the Hyperions..."
He brought out the 31 and 36 mm models and opened the box for the 36. 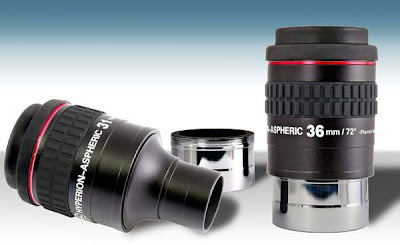 It is an attractive looking eyepiece. We crunched the numbers: 36mm with a 72° AFOV yields a 1.3-ish degree TFOV. Nice! That's what I'm after. And the best news? Attractively priced! $269 for the 36 (and $249, I think, for the 31). The excellent price left me enough money to buy something else! So I picked up a 40mW green laser too!